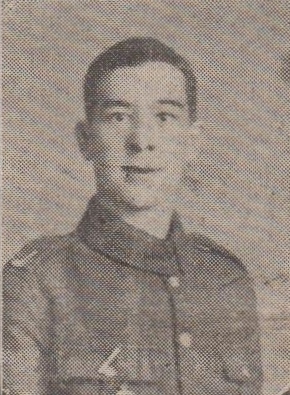 Official news has been received by Mrs. Lewis of Coal Hey, Haslingden, that her son, Private Alvin Lewis, East Lancashires, was killed in action on October 9th, 1917. Aged 22, he joined the colours in January 1916, and went to the front in February, 1917. Before enlisting, the deceased was a weaver at Parker's and Haslam's Mill, and his name is on Haslingden Parish Church roll of honour. Two of his brothers and a brother in law are serving with the colours, and another brother in law was killed six months ago. A memorial service was held at Haslingden Parish Church on Sunday morning for Privates Tom Nuttall and Alvin Lewis, both killed in action. Members of the C.L.B. sounded "The Last Post," and Mr. Heathcote (organist) played "The Dead March." The curate (the Rev. W.T. Evans) preached and referred to the qualities of the deceased.